HESS - Has dyke development in the Vietnamese Mekong Delta shifted flood hazard downstream? 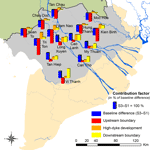 Has dyke development in the Vietnamese Mekong Delta shifted flood hazard downstream? Abstract. In the Vietnamese part of the Mekong Delta (VMD) the areas with three rice crops per year have been expanded rapidly during the last 15 years. Paddy-rice cultivation during the flood season has been made possible by implementing high-dyke flood defenses and flood control structures. However, there are widespread claims that the high-dyke system has increased water levels in downstream areas. Our study aims at resolving this issue by attributing observed changes in flood characteristics to high-dyke construction and other possible causes. Maximum water levels and duration above the flood alarm level are analysed for gradual trends and step changes at different discharge gauges. Strong and robust increasing trends of peak water levels and duration downstream of the high-dyke areas are found with a step change in 2000/2001, i.e. immediately after the disastrous flood which initiated the high-dyke development. These changes are in contrast to the negative trends detected at stations upstream of the high-dyke areas. This spatially different behaviour of changes in flood characteristics seems to support the public claims. To separate the impact of the high-dyke development from the impact of the other drivers – i.e. changes in the flood hydrograph entering the Mekong Delta, and changes in the tidal dynamics – hydraulic model simulations of the two recent large flood events in 2000 and 2011 are performed. The hydraulic model is run for a set of scenarios whereas the different drivers are interchanged. The simulations reveal that for the central VMD an increase of 9–13cm in flood peak and 15 days in duration can be attributed to high-dyke development. However, for this area the tidal dynamics have an even larger effect in the range of 19–32cm. However, the relative contributions of the three drivers of change vary in space across the delta. In summary, our study confirms the claims that the high-dyke development has raised the flood hazard downstream. However, it is not the only and not the most important driver of the observed changes. It has to be noted that changes in tidal levels caused by sea level rise in combination with the widely observed land subsidence and the temporal coincidence of high water levels and spring tides have even larger impacts. It is recommended to develop flood risk management strategies using the high-dyke areas as retention zones to mitigate the flood hazard downstream. How to cite: Triet, N. V. K., Dung, N. V., Fujii, H., Kummu, M., Merz, B., and Apel, H.: Has dyke development in the Vietnamese Mekong Delta shifted flood hazard downstream?, Hydrol. Earth Syst. Sci., 21, 3991-4010, https://doi.org/10.5194/hess-21-3991-2017, 2017. 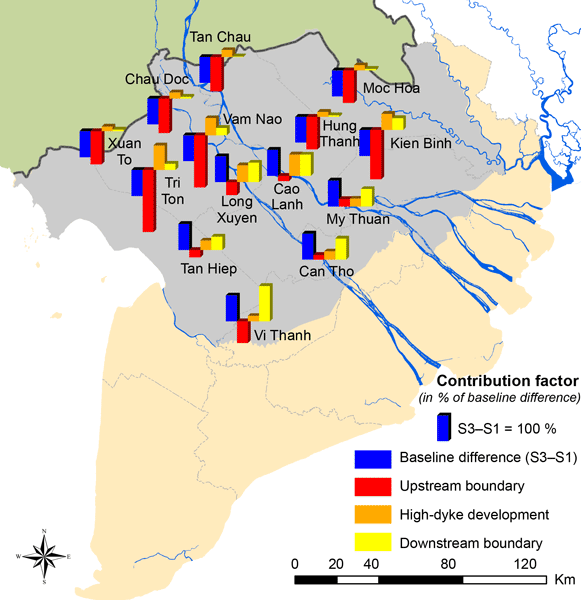 In this study we provide a numerical quantification of changes in flood hazard in the Vietnamese Mekong Delta as a result of dyke development. Other important drivers to the alteration of delta flood hazard are also investigated, e.g. tidal level. The findings of our study are substantial valuable for the decision makers in Vietnam to develop holistic and harmonized floods and flood-related issues management plan for the whole delta.